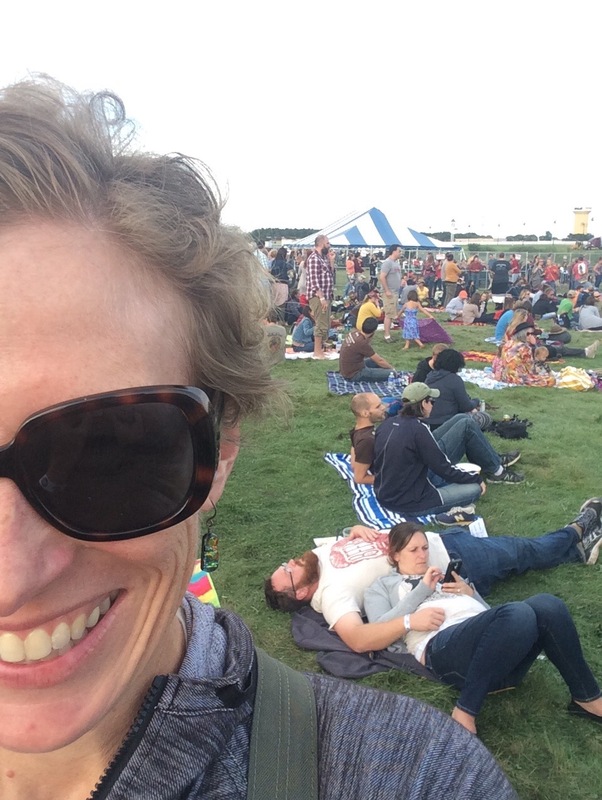 I came to a realization this weekend, as Steve and I sipped some fantastic Belgian-style beer at tap room number two (Sidhe Brewing) on Saturday, bookending a surprisingly brief visit to Festival Palomino, in the middle of Saturday afternoon. The realization isn’t that I disliked any of the bands lined up at Canterbury Park. In fact, the set that drove me to buy the festival tickets – Father John Misty’s inspired, energetic (and bendy. He was very … bendy) one – was great. The weather was good, the beer palatable and the people there were cool, having a good time & letting everyone else have a good time, too. They were fairly attractive, as well (noted, by Steve: the majority of them were younger than us. Whatever. I disagreed). My realization: I don’t like (hate would be awfully strong but frankly true) jam-session performance. In principle I love the idea and even the sound but the live experience … blows. For me. I’m glad a lot of other people dig it in general and dug it on Saturday because Trampled By Turtles put on a great festival, from what we saw in the hour or so we were there. Yes! I’m admitting it. Steve already knew it because he suggested we leave before most of the jamming started. My dislike of the genre is partly due to a poor experience I had many years ago at a Phish concert. And another one I had with an avowed Grateful Dead fan who burned me accidentally with a cigarette at a party in college. So … two individuals. Neither had much to do with the music but it’s funny how things stick. The other part of my dislike is the need for a finite beginning, middle and end to songs, even if they are long. I apparently like time and experience to be broken up into manageable, distinct bits. My relief: at least we’re not getting too old for this stuff (but maybe too loaded with baggage?). We were nevertheless in bed by ten that night. So. Here’s a cookie recipe. 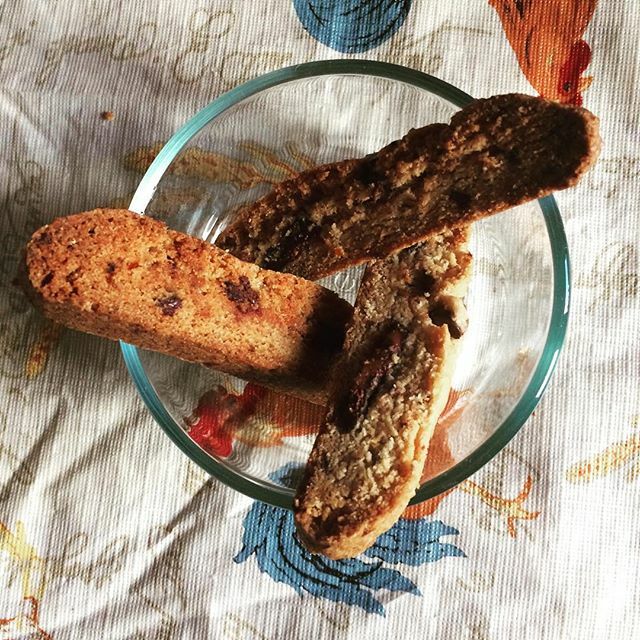 It’s a slight variation on one of my favorite cantucci/biscotti recipes, from the Veganomicon cookbook, by Isa Chandra Moskowitz and Terry Hope Romero. I love this recipe and all its variations because it’s got a snappy crunch that all other biscotti/cantucci recipes – most of which use eggs and/or butter – lack. Preheat oven to 350 F. Lightly coat a baking sheet with cooking spray or use a Silpat mat on a baking sheet. In a large bowl, whisk together orange juice and flaxseeds, beating for about 30 seconds. Add sugar, oil, orange zest and vanilla and mix until smooth. Sift in flour, arrowroot, baking powder and salt. Stir to combine. Just before dough comes together, add chocolate chips and use your hands to knead them into dough. Dough will be stiff. Transfer dough to prepared baking sheet. Form dough into a rectangle about 12 inches long and 4 inches wide; wetting your hands will make shaping it easier. Bake for 28 minutes or until lightly puffed and browned. Once baked dough has cooled, use a heavy, very sharp knife to cut it into ½-inch thick slices. Arrange slices on their side on baking sheet and bake for another 13 minutes. Allow biscotti to cool for a few minutes on baking sheet before transferring to a rack to cool completely.